For centuries, people have trusted on natural remedies to cure health issues and disorders. Natural remedies are safer and cost effective in comparison to the costly and sometime harmful chemically processed products. Among all the other, one such ingredient that has been used in various natural remedies is vinegar. It is also widely used for household and cooking purposes. However, among all types of vinegar available today, the most popular one is apple cider vinegar (ACV). Due to its wide variety of usage and benefits, apple cider vinegar has become a common household name today. Apple cider vinegar is loaded with medicinal properties; from curing diabetes to protecting heart, helping in weight loss to detoxification, there are a number of benefits and uses of apple cider vinegar. And today in this post, I am sharing the most surprising benefits and uses of apple cider vinegar. The discovery of vinegar dates back to around 5,000 BC, the era when unprocessed grape juice was converted into wine and then vinegar. It is believed that even Hippocrates used it to cure wounds, while the 1700s medical practitioners used it to cure everything starting from poison ivy to stomach pains. I am sure you have used apple cider vinegar in cooking and for other purposes, but today you will be surprised to note the other essential benefits and uses of apple cider vinegar. However, before using apple cider vinegar, it is vital for you to keep in mind that it is not created equally at all times. In comparison to the clear vinegar, only raw organic apple cider vinegar contains the “mother of vinegar” that is the amino acid based matter that resembles a cobweb. This unfiltered and unprocessed form of vinegar is certainly the best quality vinegar. Most manufacturers sieve their vinegar, which prevents the formation of the “mother”. So if you are buying apple cider vinegar, go for the “murky” ones. I am sure you are excited to know all the benefits and uses of apple cider vinegar, but before we get into the uses and benefits, let’s take a good look at the constituents of apple cider vinegar that make it such a versatile ingredient. Organic raw apple cider vinegar (ACV) is made from apples that are grown organically. Since it is not pasteurized, it retains maximum of the key components that is very beneficial for human health. The making of apple cider vinegar involves two fermentation processes. During these procedures, various enzymes and nutrients are produced, which makes it a life-giving ingredient in many health remedies. 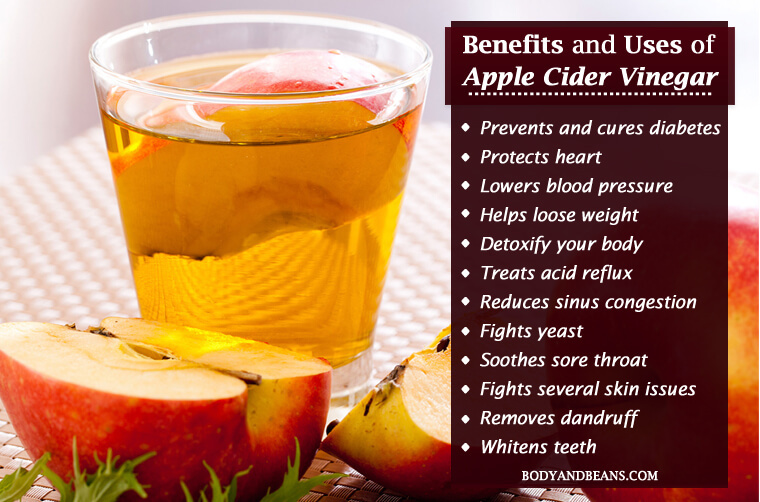 Here are some of the most effective health benefits of ACV. The anti-glycemic property of apple cider vinegar is said to be very beneficial for controlling blood sugar levels. The key ingredient in it is acetic acid that helps to lower the blood sugar as it prevents the complex carbohydrates from getting digested. It either accelerates gastric emptying or increases the uptake of glucose by the tissues. Studies by “American Diabetes Association” have shown that it improved insulin sensitivity in Type II Diabetic patients as well as pre-diabetic patients. You can take 2 teaspoon of apple cider vinegar before going to bed in order to lower blood sugar level. Studies have shown that this procedure proved to be very beneficial for diabetic patients. Apple cider vinegar protects the heart, which is the most vital organ of our body, failure of which has resulted to maximum deaths in the recent times. The rich, unhealthy foods that are so often eaten in today’s lifestyle increases the level of bad cholesterol which has further doubled the risk of strokes and heart attacks. However, as explained by the “Journal of Food Science” apple cider vinegar contains chlorogenic acid, which inhibits oxidation of LDLs. This protects our body from various cardiovascular diseases. High blood pressure is another factor that risks our heart. So it should be controlled from the very beginning. According to researchers, you can reduce your blood pressure by consuming apple cider vinegar. Further experiments on laboratory rats are a proof that the acetic acid content in ACV is beneficial for lowering the blood pressure. 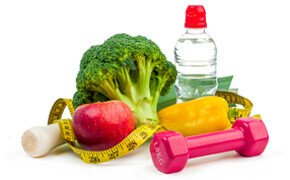 Being an overweight or obese person is a major problem nowadays as it increases the chance of a whole lot of diseases. But do you know you can control your weight by consuming apple cider vinegar? Well yes, ACV reduces the sugar craving and improves the process of detoxification. Studies have shown that with its consumption you actually can cut down your calorie intake by 200 to 275. Thus, lesser calories mean weight loss. You can try out the consumption of vinegar with bread that will give you a feeling of satiety. Another study show that the acetic acid present in it gives this feeling of fullness. Your body contains lot of toxins that can adversely affect your health. The unprocessed apple cider vinegar is a liver and lymphatic tonic, which helps in the detoxification of your body. The pH level of your body is balanced by it. It further stimulates proper bowel motility and facilitates lymphatic drainage. If your body is not producing adequate amount of acids needed for digestion, you can mix 1 tablespoon of apple cider vinegar into a cup of water and drink it on a daily basis. This way you can get rid of the acid refluxes and heartburn. Apple cider vinegar will improve the acid content of your body and give it the needed enzymes and probiotics, imbalance of which causes acid reflux. The pectin present in apple cider vinegar is also good for your intestines. However, if you are having reflux due to too much acid in your body, then please avoid ACV. When you have excessive mucous in your body it leads to sinus congestion. You then have breathing trouble. However, you can reduce the problem with apple cider vinegar as it breaks up the mucous in your body. All you need to do is to mix it with warm water and then apply some of it on your palms. Then puff it with one nostril at a time and thereby repeat the same process with other nostril as well. This will give you relief from sinus congestion. In addition, the antibacterial property of ACV will protect you from the infections. The production of unwanted yeast and bacteria in your body leads to bad breath, feeling of fatigue and digestive trouble. But you can get rid of all these with apple cider vinegar. ACV contains many acids like, acetic, isobutryic, propionic and lactic acid, which prevents the growth of unwanted bacteria and yeast in your stomach. In addition, the probiotic content in it also helps to kill the yeast. Apple cider vinegar is a natural cure for sore throat. It contains many vitamins and most importantly acetic acid that boosts the probiotics in body. Besides the antibacterial properties in it also helps to soothe your sore throat. The best way is to gargle the mixture of undiluted apple cider vinegar with warm water. It helps to thin or loosen the mucous in the throat thereby providing you with relief. Prevents the occurrence of eczema and acne. Apart from the various health benefits, apple cider vinegar (ACV) has many beauty benefits as well. Your hair needs thorough conditioning after getting exposed to the harsh weather conditions and pollutions. And as I always say a natural conditioner is best. So when you have a natural conditioner like apple cider vinegar, there is nothing to worry. You can mix 1 tablespoon of organic apple cider vinegar with 1 cup of water and pour this mixture on your hair after shampooing. Another method is to spray your scalp with this mixture. Then wrap a towel and wait for about an hour. Post that, rinse your hair thoroughly. These methods give your hair the proper conditioning and leave it shinier. Another reason to include apple cider vinegar in your hair care routine is that it is efficient in removing dandruff. It is believed that the acidic content in apple cider vinegar does not favor the growth of the fungus that is mainly responsible for dandruff. Why let those ugly stains hamper your pretty smile? Use apple cider vinegar, which is a natural teeth whitener. Just take a bit of ACV and rub your teeth with it. After that, rinse your mouth with water. After few uses, you will notice significant improvements. Besides whitening teeth, gargling with diluted ACV removes bad breath. So maintain your oral hygiene with ACV. Just remember not to use it too frequently as the acids present in it might harm your teeth. Body odor is something that is a complete no-no. It immensely turns one off and creates a very bad impression. So if you are suffering from bad body odor do not forget to dab a bit of ACV under your arms. It kills all the bacteria that cause the odor. Talking about body odor, another body part that stinks a lot is your foot. You can also remove your foot odor with apple cider vinegar. Just wipe your feet with it and get rid of the smell. Apple cider vinegar is a perfect toner for your face. You can apply it with a cotton ball on your face. ACV is the apt cleanser that evenly tones your face, removes all the dirt and leaves it glowing. You can remove the blackheads and other marks as well with ACV. If you want to soothe your skin post shaving, just dilute apple acid vinegar with water and apply on your face. It will soothe your skin far better that the other commercial and artificial aftershave products found in market. Apart from being healthy for your skin, hair and health, there are many other uses of apple cider vinegar. You can use apple cider vinegar to clean your home. The antibacterial property of ACV helps to kill the germs and the bacteria. You can easily spray a mixture of ACV and water to the curtains and other nook and corner of your house. If you are fed up of weeds and want to throw them out of your garden, here’s the best solution to it. Use ACV on frequent basis which will kill them and protect your garden. You can keep apple cider vinegar in a bowl and this will remove the stink from the rooms and naturally neutralize the odors. Apple cider vinegar is a natural cleansing agent and it kills the harmful bacteria and other pesticides. You can make a solution of ACV and water and wash your fresh fruits and vegetables in it. Then carefully rinse them with plain water. This will make the vegetables free of germs. You can use apple cider vinegar to polish various metals. Like the mixture of vinegar and baking soda is good for silver. To polish brass, copper or bronze, you can coat them with ACV and salt. Then rinse them in cold water and pat them dry with a towel. Apple cider vinegar has number of uses and benefits and hence it has become one of the most popular ingredients for various remedies. This natural, cost effective ingredient is definitely one of a kind. Just one word of caution, please do not over do it as the acids contained in it may cause a reverse effect on your health. Maintain caution and make this amazing ingredient a must have in your kitchen. Have you ever used apple cider vinegar? Have you benefited from it? Do share me your feedback and do not forget to like, share and comment if you find this post useful.